"sa susunod na pumunta ka ng singapore," iton said while we were waiting for a cab after i convinced him to go home early (or earlier than usual), "pumunta ka naman nang walang takbo, para maka-gimik tayo." it was this subtle, if not brutal suggestion, that served as my counter mantra for the 3 hours that i baked under the sun during last month's standard chartered half marathon in singapore. i actually didn't want to write about my run there because it was a complete disaster. 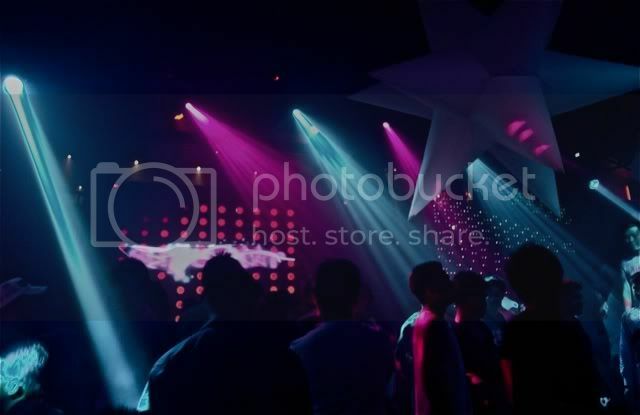 it began that evening when another friend who was also in town asked if we could go out. i agreed but wanted to be a cinderella about it: planned to leave by midnight. but as luck would have it, i was home shortly before 2am, and could not lull myself to sleep. i had done worse in my first standard chartered singapore marathon, and still finished with personal best 21K time, but i wasn't sure about this last race. it began with the baggage handling. i planned to deposit a bag so that i could quickly take off my shoes, wear dry shorts, and limp my way back to geylang after finishing. but although i was 45 minutes early for the gunstart, it took me more than an hour to have my bag checked in. they were very orderly and systematic. teenage volunteers tagged our bags, sealed them in clear plastic bags, and had our names and contact details written down on stickers. by the time i was running to the starting point about a kilometer away, the line was even longer than when i queued. 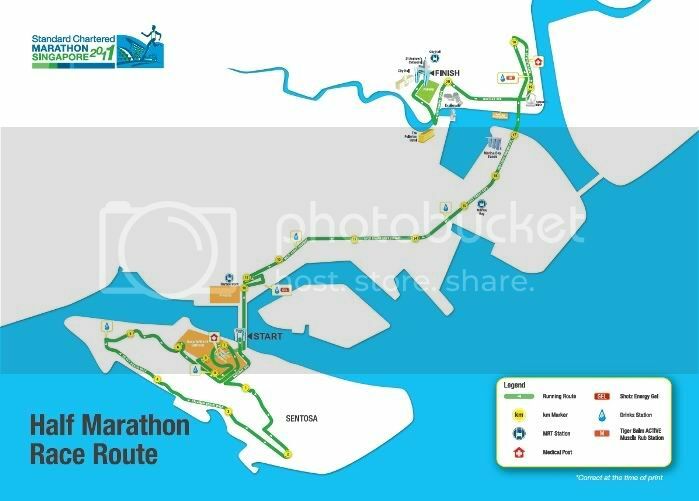 the half marathon had the same route as last year's, so we started at the bridge going into sentosa. by the time i stepped on the timing mat, elite runners were already leaving the island: i was 30 minutes late. 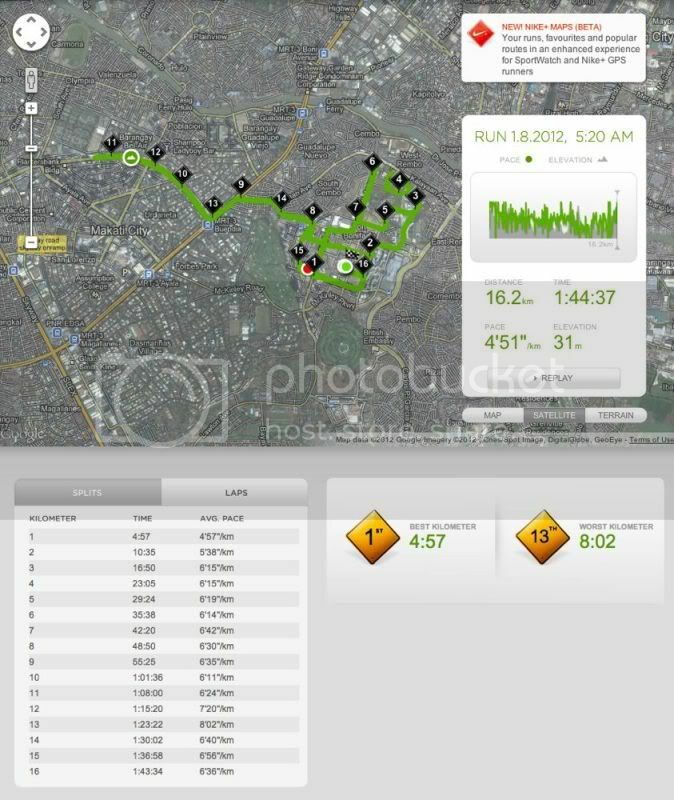 inside sentosa, we ran just a little under 11km, passing siloso beach, resorts world, and universal studios. there were portions where the trail funneled into tight spaces that forced us to slow down into a trot, but it wasn't as bad until we took the tunnel (where i lost my GPS signal) out back onto the mainland. i had to walk to the bridge because it was extremely crowded, but when the route began to widen on the elevated expressway, for some odd reason, i couldn't get myself to start running. iton's mantra had so affected me that i was so far out of my zone. i was just not interested in running at all, on top of the fact that my pacer: a woman wearing an orange shirt that said she ran an 18K race organized by nathan just two weeks earlier, had herself decided to walk. i wasn't even tired, or feeling pain. i was just not in the mood. suddenly, i got irritated by the littlest things: my 2XU compression race socks were too tight. my 2XU visor was in the way, and the music that played on my iPod -- a playlist i prepared just for the run -- wasn't motivating me. nothing could, not even the prospect of personal shame and ridicule. 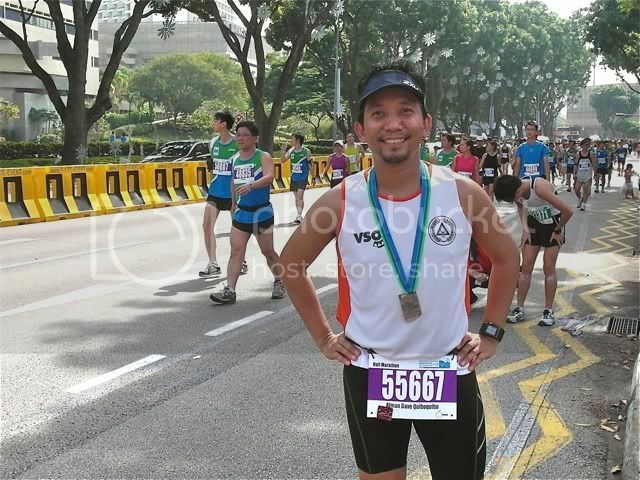 and i made a personal pact: that would be my last standard chartered singapore marathon. with over 60,000 runners converging on singapore's well-paved streets, even the mammoth logistics that produced this spectacle of a race could not prevent the things that i would usually complain about: irritating bottlenecks, delays, and paper cups piling on the streets. trust singaporeans to discuss the merits of water stations vs personal hydration because of its impact on the environment: during the actual race! when i finished, i was rather surprised that i was still faster than more than half of the participants in my category: thousands were still rolling into the padang, a field made muddy by the previous day's rains and hundreds of thousands of footfalls. in fact, the delay at the baggage deposit may have been done on purpose to whittle down the volume or runners at any given hour. was i disappointed with how my half marathon turned out? supremely. to think that i had not prepared this well for any of my other 21K's: in november alone, i racked up over 86kms getting my legs primed for the race, stringing 4 10K events and several practice runs in between. since i began recording my runs, it is so far my longest mileage in the space of one month. overall, however, my 2011 looks sparse in this category. although i started out with a blistering month in january, i was going on a downward spiral which hit rock bottom in april when i logged zero runs. i tried to pick up the following month, when i got the nike+ sportwatch (which gave me more accurate feedback), but couldn't collect more than 36kms in any month. my legs almost forgot the once familiar sensation of running. 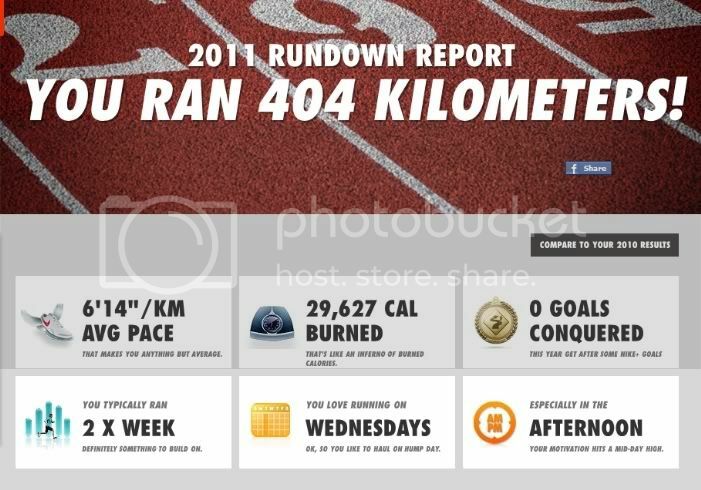 so in 2011, i just ran a little under 404 kilometers. that may sound impressive to my non-runner friends -- that's basically the distance between makati city and laoag (as the crow flies) -- but it pales in comparison to those i know who've done a couple of ultramarathons, pocket a few marathons in a year, and train for long-distance triathlons. it's even 27kms shorter than my 2010 record. if you break it down, that's on average just 7km a week, when i should be doing at least 15. and my average pace is still a little off the mark. so hopefully this year will be a better one for my running: i will need those muscles should the world end i need to escape crumbling buildings or swooping tidal waves. and what a way to start but with my favored distance. the 16K category of the PSE bull run is my first foot race for the year, which nearly went awry because i had to entertain guests from slovenia which ended with us toasting na zdravja well after midnight. andri in fact was trying to talk me out of running, and just gulp more shots of schnapps but i decided to turn in and suit up for the run even when it was obvious i had a hangover. it really is not the best way to start a race: reeking of alchol, nursing a headache, dehydrated ahead of the gunstart, and not having invested in enough kilometers because of the ensuing holiday. but i manned up and committed to give it my best shot. my previous time in this distance was sub 1:42. it would have been good to beat that time, but given my peculiar circumstances and the fact that my last 16K during the condura run was slightly over 1:45, i just wanted to end up on the finish line instead of inside an ambulance, or at the first aid station. the bell rang at exactly 5:20 am, and we ran around a pre-dusk bonifacio global city, and into the pitch blackness of the road between british school manila and the manila japanese school. since humans are not equipped with night vision, i wouldn't be surprised if anyone tripped over one of those plant boxes there. i ran rather well in the first 10km of the race, and at the time, i was happy to have covered that distance within my personal cut-off, but somehow, i kept going, so i figured i could probably finish this in less than 1:45. i slowed down at kilometers 12 and 13, on the way up the flyover into BGC, but tried to pick up my pace again, and zoomed to a sprint going into the finish line. i felt very good afterwards, and said to myself: if i ran like this in december, i would have achieved a PR in the half marathon. but my new year has no space for regret. that's why we look at 2011 and see where we may have erred and learn how to do things differently. 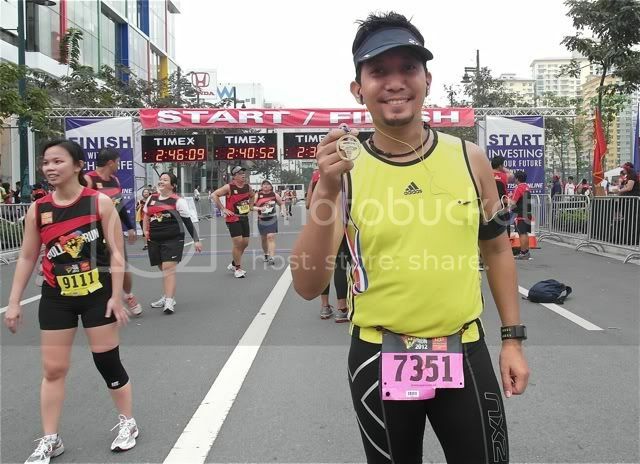 each year, i am a better version of myself, and hopefully, this 2012, a much-improved runner.